Many of you will no doubt have been glued to the coverage from 7.35am this morning. I’m not normally one for sitting in a grandstand at a golf event as I generally like to get out and wander, but with reserved seats this morning courtesy of my hosts at Rolex, it would have been rude not to get up at 5.00am for the second morning in a row and avail myself of such a privileged spot. 1. The sun gradually rising to reveal the glorious Perthshire countryside in all its glory. 2. The welcome for Ivor Robson and the chanting of, ‘Ivor, Ivor, give us a wave.’ It was a real shame he then fluffed his opening line. 3. Webb Simpson’s opening sky-duff which didn’t get halfway up the hole. I think it was actually a hybrid not a 3-wood, so the moral of the tale is, when you’re faced with the scariest tee-shot of your life, don’t use your very smallest club. 4. Bubba whipping up the crowd, then hitting a massive banana slice which almost started out over the heads of Monty, Butch and Darren in the Sky commentary booth. 5. 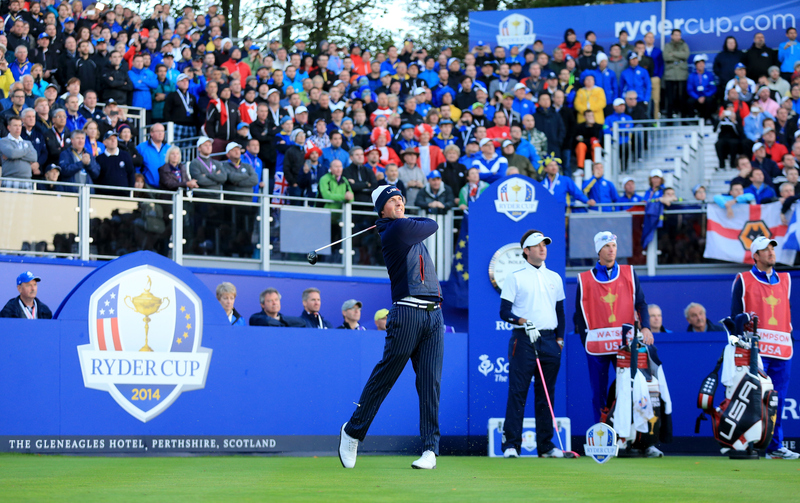 The sheer volume of the cheers as every European pair appeared and was announced. 6. 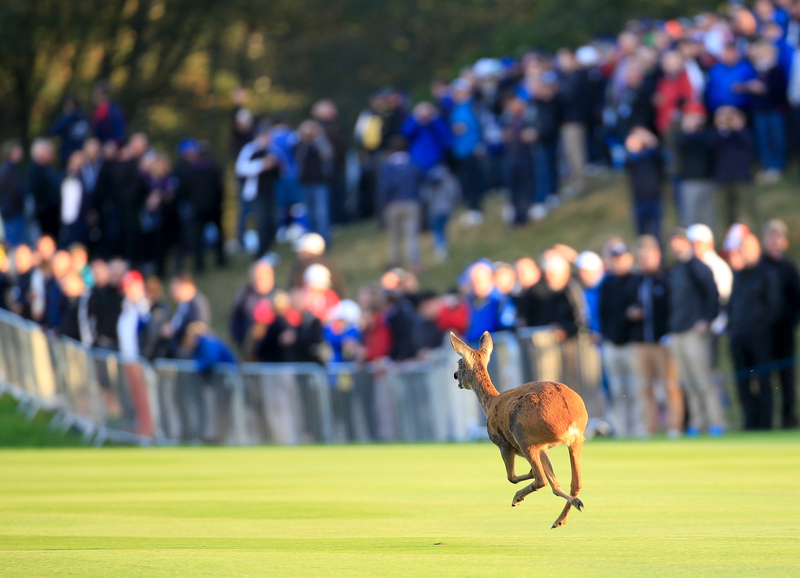 A second startled deer (after Webb Simpson) making an appearance only to find his usual grazing ground occupied by about 20,000 people! This startled deer found himself playing to a vast crowd! 8. Three or four resilient US fans being booed good-naturedly by the massed Europeans whenever they put their vocal chords over the parapet. 9. 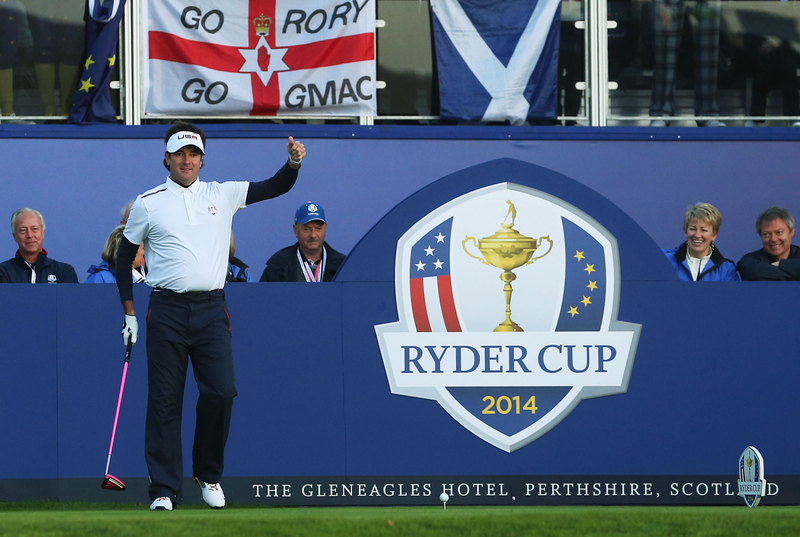 The roars that greeted captain Paul McGinley when he first appeared on the tee. 10. The spontaneous rendition of, ‘There’s only one Tom Watson’, amid all the pro-European chanting.